Blue Barn Ranch is a family-owned boarding facility. We board horses, dogs, cats and small animals. We have corrals with shade covers, corrals with three-sided shelters and stalls in our beautiful barn with attached corrals. 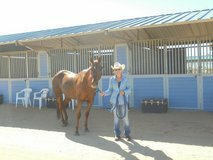 Our amenities include: Two arenas, two round pens, a hot walker, tack room, wash rack and a restroom. We offer full-service boarding, vacation boarding and trailer parking. We have short, long-term and extended boarding for dogs, cats and small animals. This includes play/exercise time daily. 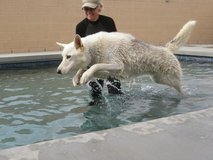 We have several training programs: Obedience Training, Agility, and Tracking/Scent Games! Kathi is a Certified Dog Trainer. We offer socialization and grooming too. We have experience with most types of animals and our ranch has easy access and plenty of safe parking. References are available as well as email and picture updates. Blue Barn Ranch is open daylight hours. We care like you care.